- Made out of ultra-thin reflective polyester film, this lightweight sleeping bag weighs just 4.3 ounces. When inside the stuff sack this bivvy bag is so small it fits in the palm of your hand. - The bright orange color of the sleeping bag cover helps rescuers identify you with ease. Plus, the material reflects 90% of your body's heat back to you. - This sleeping bag will surprise you with its strength. It's tear-resistant, windproof AND waterproof. Plus, this bivvy bag features reinforced taped seams. - Just unpack the sleeping bag from the included stuff sack and slide inside - or use it as a sleeping bag liner and raise your body temperature by 20°! - Satisfaction is our #1 priority, If for any reason you are unsatisfied, simply contact us to return the product for a FULL Refund or Replacement. Click Add to Cart Now! Packed Measurement: 7" x 5" x 1.5"
【ULTRA LIGHTWEIGHT】: Made out of ultra-lightweight reflective polyester film, this survival blanket sleeping bag weighs just 4.3 ounces. It also compresses into a tiny stuff sack, so you can carry this emergency sleeping bag with your survival kit everywhere you go without weighing yourself down. 【MADE FOR EMERGENCIES】: The bright orange color of the light weight sleeping bag cover helps rescuers identify you with ease. Plus, the material reflects 90% of your body's heat back to you, making it an essential survival tool and addition to your bug out bag, emergency shelter or camping gear. 【INCREDIBLY DURABLE】: For its weight and thinness, this sleeping bag will surprise you with its strength. The material ensures a tear-resistant, windproof and waterproof sleeping bag. Plus, this emergency bivvy bag features reinforced taped seams, creating a weather-resistant barrier between you and the frigid cold. 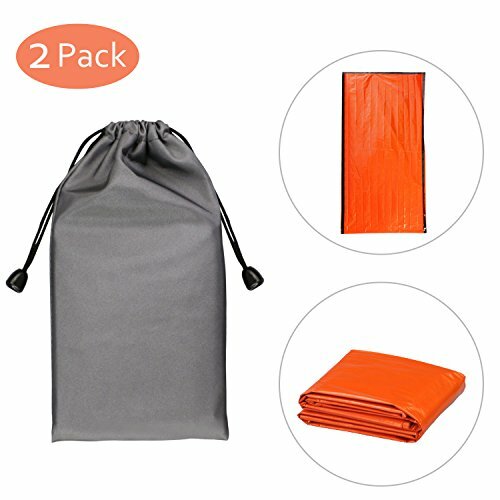 【CONVENIENT TO STORE】: When inside the stuff sack this emergency bag is so small it fits in the palm of your hand - which means you can store it anywhere. We recommend keeping it with your survival kit, in your bug out bag, camping gear, and glove box so you have it ready when you need it. 【MULTIFUNCTIONAL】: Emergency sleeping bags are not only for survival situation use, they're also perfect for personnel use. The packages are so compact and light weight. Take them with you when you go for camping, hiking, and outdoors adventure. They will fit in your pocket, handbag, backpack, etc. Store them in your home and car. Always get ready if needed. If you have any questions about this product by Philonext, contact us by completing and submitting the form below. If you are looking for a specif part number, please include it with your message.